a grounding terminal at the end of each main conductor. A typical lightning protection system in a watercraft has four major components. 1. Strike termination devices, or air terminals, provide terminals for the lightning to attach to the watercraft. 2. Main conductors conduct the lightning current towards the water. 3. Grounding terminals allow the current to exit into the water. 4. A network of bonding conductors equalizes voltages between the lightning protection system and conducting fittings. to minimize shock hazards for the crew. Present standards for lightning protection systems specify an immersed grounding terminal with a 1 ft2 grounding area. However, grounding is more effective if multiple grounding terminals are distributed over the hull. Also, since current tends to flow into the water in spark channels, contact area can be augmented through spark initiation. See pages 4 - 6 in the April/May 2004 issue of Professional Boatbuilder. the charge removed by lightning resides on the surface of the water. Electrodes are designed to meet NFPA standards for air terminals. Each electrode requires only one mounting hole. Electrodes can be faired into the hull, thereby reducing drag and avoiding galvanic corrosion. Electrodes are mounted preferentially above the waterline. Routing lightning conductors around sensitive areas reduces emi and shock hazard. 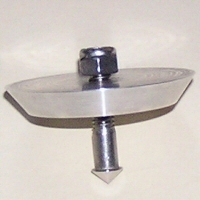 Electrodes are shaped to promote initial current flow. suggest layout for lightning conductors and grounding electrodes. to route connecting conductors externally to simulate a Faraday cage. bonding of all metallic fittings close to the lightning conductor. Lightning strike data has revealed that the 1ft2 area for a ground plate is completely inadequate in fresh water, and even in salt water sideflashes can occur from fittings close to the water. The physical principles used to calculate, for example, ground resistance from an immersed plate are of questionable relevance. A single centrally-located down conductor maximizes the risk of generating sideflashes to other fittings and shock hazard. Bonding conducting fittings to the lightning protection system increases the risk of a sideflash to the water. These problems are illustrated in the two case studies discussed in Appendix A.
placing bonding conductors as far as possible from the water. One or more main conductors are split into several grounding branches. Main conductors are routed preferentially external to interior spaces. Each grounding branch is terminated in a grounding terminal. Multiple grounding paths maximize the discharge area around the hull. Sideflash risk from a fitting to the water is reduced in the vicinity of any grounding terminal. Sideflash risk between fittings is reduced through bonding. Internal sideflashes connect from a fitting to another fitting inside the boat. External sideflashes connect to the water. for a fitting near the beam, how close it is to the waterline. Relative risks are summarized in Table 4‑1. Regions where the sideflash risk is high are illustrated in Figure 4‑1 . This is a simplified yacht with mast, forestay, single set of sidestays, keel bolts connecting to ballast, and a conducting tank forward. In a more typical yacht the region of high sideflash risk would be more likely to encompass the complete volume of the hull below the waterline. Carbon fiber is a conductor but the composite contains non-conducting elements. It is not possible to bond each fiber to the lightning protection system. A carbon fiber hull may be weakened after a lightning strike as a result of the destruction of localized fibers at both entrance and exit points and in narrow channels in between. General guidelines are not possible for CFC hulls or fiberglass hulls containing CFC components. However, we are presently developing proprietary products that address the problems with CFC. 1. An immersed terminal that is in contact with the water conducts current directly into the water. Current flows in the water by direct contact with the water. The actual mechanism is not well understood. Since the charge removed by lightning is on the surface of the water, immersed terminals should be placed as close to the water line as possible while still being immersed. 2. A SiedarcTM electrode first initiates a spark to form a conducting path towards the water. The spark channel typically branches and spreads out in the air just above the water surface and neutralizes charges on the water surface. SiedarcTM electrodes should be placed as close to the waterline as possible while still being in air. Since most lightning strikes occur while a boat is either at anchor or at the dock, the unheeled waterline can be used. To initiate current flow down desirable conductors such as an aluminum mast. To lower the overall resistance between the lightning protection system and the water. To bypass a conducting fitting or conductor such as water ballast. To extend the equipotential range of the lightning protection system into the water. Voltages should also be equalized near electronics and wiring. Spark risks should also be minimized in any region containing flammable materials. On board conducting fittings require bypass electrodes. Existing standards dictate that at least one 1 ft2 immersed grounding terminal is required. The water conductivity is critical in planning how extensive the grounding network should be. In fresh water sideflashes are highly likely from any conducting fittings below the water line and all chainplates. The design should utilize many electrodes near sideflash hazards, and distributed over the hull surface. In salt water sideflashes are much less likely, with conducting fittings closest to the hull and chainplates being most at risk. Additional electrodes are recommended below all chainplates and near hull-mounted fittings below the waterline. Since fresh water floats on top of salt water, the upper layer of water in a tidal creek and at a river mouth is fresh, especially during rainfall. Tinned copper with insulation rated to 600V is the recommended composition for most connecting conductors. However, for aluminum-to-aluminum connections aluminum strip or cable can be used. The suggested cross-sectional area depends on the application. A main conductor is intended to conduct an appreciable fraction of the lightning current, some tens of kiloamps. The cross sectional area for copper should be at least 21 mm2 (4AWG). We recommend 2AWG. A bonding conductor connects fittings to conductors or other fittings, predominantly in horizontal planes, for potential equalization. The cross sectional area for copper should be at least 16 mm2 (6AWG). The loop conductor is comprised of main-size conductors. Other metals and metallic fittings can be used as lightning conductors if equivalent. Connections should have at least the contact area of the corresponding lightning conductor. We provide a line of connectors for all types of connections. The loop conductor should be as far outboard as possible and above the waterline. All large metallic fittings at deck level should be incorporated into a network that is bonded to the loop conductor. Bonding conductors should be oriented parallel to the water surface. Main conductors should be oriented perpendicular to the water surface. As many grounding branches as possible should be distributed evenly around the hull perimeter, where each branch comprises a main conductor terminated in a grounding terminal. Connections should be located to minimize bends in main conductors. Substantial immersed fittings such as unencapsulated ballast and propeller struts can be used as immersed grounding terminals. - establish multiple grounding paths to maximize discharge area and minimize overall impedance. Grounding branches promote current flow in parallel paths around crewed areas to minimize emi. Connections between grounding branches are made well above the waterline in a horizontal plane. Bonding connections to conducting fittings eliminate the risk of internal sideflashes. Overall, the grounding system resembles a rib cage with a well protected region inside the region bounded by the ribs. Current flow into the water at the base of each rib tends to establish an equipotential region inside the water, approximating the effect of a Faraday cage. perpendicular connection for above or below the waterline where space permits. Both electrodes are swaged to AWG 2 tinned copper battery cable. More details about electrode options are given on our Products/Siedarc page. The connection is perpendicular to the hull surface. About 13" of clearance (measured from the head) is needed for inserting the electrode (~5" long) if a minimum radius of curvature of 8" is desired in the connecting cable. The ideal geometry for the connecting cable is a straight perpendicular to the hull, that is along a radius. The connection is made parallel to the hull to enable the cable to be parallel to the hull. Since a heeled sailboat may place a parallel connection below the heeled waterline, the best practice is to arc the cable away from the hull surface as close as possible to the electrode. In this case the radius of curvature should not be less than 8". Figure 5-2 shows the dimensions for the three types of through-hull used in Siedarc TM electrodes - flush-head, mushroom-head, and stainless. Cored hulls should be hollowed out to a distance of at least 1" and filled with epoxy or other suitable material. Newly exposed fiberglass should be surface treated to be made impermeable to water. A backing plate is highly recommended. Extreme care must be taken to ensure no water seepage. If any moisture is found inside hull, the whole hull should be dried. Gel coat blisters should be treated by surface planing, and the hull thoroughly dried before electrodes are mounted. Any moisture that is left in the hull is likely to explode during a lightning strike, dislodging the electrode and leaving a hole in the hull. Siedarc TM electrodes that are embedded in a flush-head fitting can be mounted so that the outer surface is flush with the hull after making a hole that matches the profile of the fitting. See Figure 5-2(a) for the dimensions. 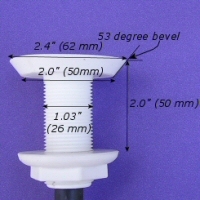 In sandwich hulls, that require an epoxy plug, or new builds, the mold insert shown in Figure 5-2(b) can be used to form the correct hole profile. An alternative is to use the mushroom-head option. Make a 2.0" diameter hole 0.33" deep in addition to the 1.05" diameter hole through the hull and, if needed, add a fiberglass buildup of at least 3/8" on the inner hull surface for reinforcement. Then the top of the mushroom head is flush with the hull. Add fairing around the edges. anywhere spark could connect with another boat, dock, or people on shore or in water. Electrodes are designed to promote high-current sparks during lightning strike and should be used accordingly. Electrodes are designed to divert lightning current from more sensitive fittings and may be sacrificial. Lightning is hazardous high-voltage high-current phenomenon and can be lethal, even from a sideflash carrying a fraction of the current. No lightning protection system is 100% effective and damage can be expected. The grounding system is not expected to prevent all sideflashes all of the time. No increased protection is claimed for electronics systems, mast, stays, masthead fittings, etc. Crew protection is dependent more on bonding between conducting fittings than the grounding system. This document is the property of Marine Lightning Protection Inc. It contains information that is privileged and proprietary and shall not be released in entirety or part to third parties without the express written consent of Marine Lightning Protection Inc. Ideas and concepts presented here may be covered by US Patent Number 6,708,638 and other US and international pending patents and may not be used in practice without a Licensing Agreement. Technical specifications in this document are based on information contained in scientific documents, standards published by NFPA, ABYC and ISO, and original calculations. Interpretations made in this document are limited by the current state of knowledge of a destructive natural process, lightning, whose behavior is not completely understood. Marine Lightning Protection (MLP) disclaims liability for any personal injury, property or other damages of any nature whatsoever, whether special, indirect, consequential or compensatory, directly or indirectly resulting from the publication, use of, or reliance on this document. MLP makes no guarantee or warranty as to the completeness of any information published herein. Anyone using this document should rely on his or her independent judgment or, as appropriate, seek the advice of a competent professional in determining the exercise of reasonable care in any given circumstances. Spark-promoting electrodes are designed to conduct large magnitude currents and may be subject to localized heating, explosive forces and hazardous voltages. Reasonable care should be exercised in their use. No warranty is given or implied with respect to any use of these electrodes. the sideflashes blew holes in the hull at the waterline. The owner of this sailboat made the observations in Figure A1‑1 . The bottom of the mast was connected to a keel bolt. The holes in the ballast indicate that current had flowed out of the keel. Two sideflashes made holes that formed through the hull fore and aft. The origin of each sideflash was a stay. Both sideflashes connected through intermediate conductors. potential equalization between forestays and water tank. Note however that equalization by bonding is not possible for the water tank. The lead ballast in this case was connected to the rigging via down conductors from the side chainplates. The owner reported similar symptoms of holes at the waterline. There was no indication that current flowed out of the keel. The down conductors initiated sideflashes. The holes were at the waterline. The main remedy here is to add a grounding electrode below each chainplate near the waterline.